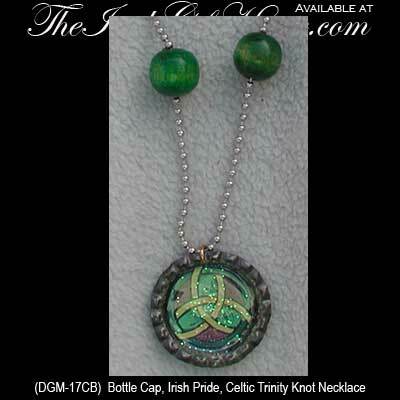 This Irish costume jewelry necklace features Celtic knot-work on a re-purposed bottle cap. This silver tone metal costume jewelry necklace features a glittered Trinity knot as bottle cap art; the custom art work is sealed in acrylic. This costume jewelry Celtic necklace measures 1 3/8" in diameter and has a 24" long metal ball chain with wooden accent beads. The Irish costume jewelry is made in the United States by Doná Fashion Jewelry and is received with a Celtic knot history card, complements of The Irish Gift House.